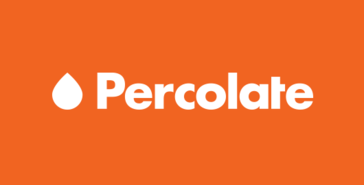 Do you work for Percolate? Learning about Percolate? We can help. Integrated Marketing Manager at Percolate Inc.
"Complicated, but useful social media management tool. " This tool integrated stock photo subscriptions right into the asset management system, so that is really convenient to have it all in one place. It's also great that you can have clients review and approved content in the system itself and quickly make changes. Also I like all of the platforms the tool supports, especially Pinterest. You get an email every time you receive are tagged in a comment, but unless you click the link from that email, there is no inbox or easy way to find all comments in the tool itself. It can be really annoying and also I worry that comments could be missed. You'll still need another tool for posting Instagram, keep this in mind. If you are a total newbie to social tools, this may be a harder learning curve than some others in terms of ease-of-use. Percolate is great because you can create multiple levels of approval. For our healthcare client, we can integrate approvals by medical staff right into the workflow, which helps us stay accurate. That's a major benefit we have seen. 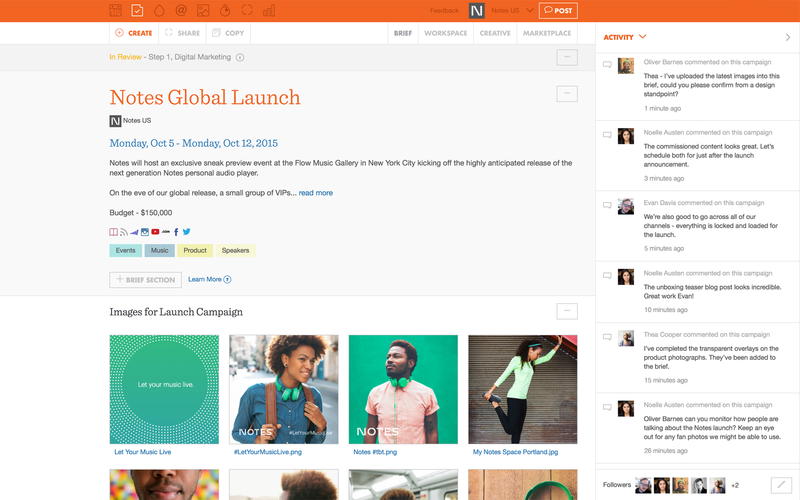 Percolate is a very robust social management tool that I really enjoyed. The Asset Management library was particularly useful as we could store all our content in one place, organized by client and then into different category folders, until we were ready to use the assets. It also has a seamless and easy-to-use content approval workflow which made it very easy to send and receive approvals with our clients. The price is very expensive. Ultimately, my small agency ended up switching to a different tool due to the price. However, if you can afford it and you have at least several different client accounts needing to be managed, it's a great platform! Percolate is enterprise-level software. It's not really suited for small agencies or those who only manage a couple client accounts. However, if you're a large agency and/or manage at least several accounts/channels, it's definitely worth looking into. Our client approval workflow improved significantly once we onboarded Percolate. No more need to send pdf's back and forth through email. Percolate also has solid analytics capabilities built in, making it easy to provide reporting to our clients on a regular basis. "Great Platform for Social Media Scheduling with Approval Workflows. " 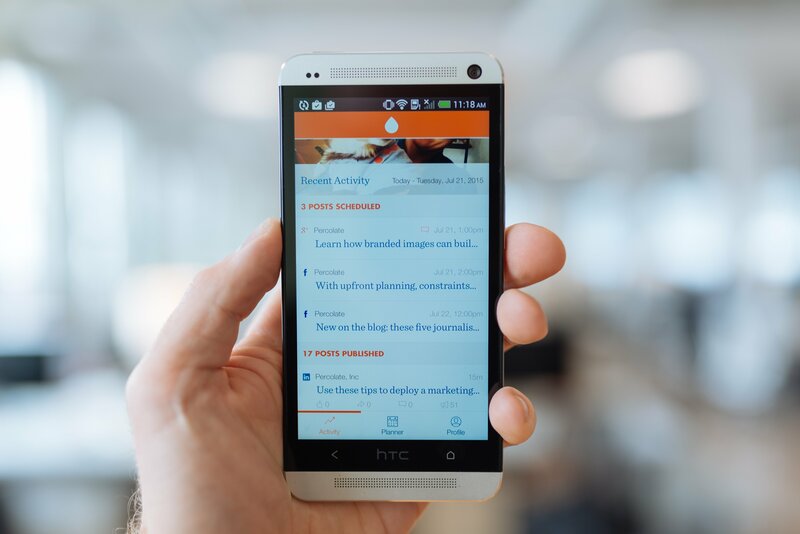 Percolate makes it easy to sync up all of your social platforms and easily post to each one. The scheduling capability is great for planning out multiple weeks of social posts at a time. The approval workflow set up was a key factor for my organization. We have to have legal approval before posting most content so allowing each post to be marked with our legal workflow and it requiring approval from the appropriate party before publishing was a huge win for my team. The planner view is also helpful in looking at a date range and easily seeing everything we have queued to publish. Once a post is sent for approval in a certain workflow, the workflow cannot be changed/ edited. Sometimes we need to make changes and then resubmit the post for approval, but we have to then start over and recreate the post because the workflow cannot be changed. Another concern is that if we miss a post for publishing (the approvers don't approve it in time), the post goes back into the draft function which makes us have to funnel to the correct tab in the platform to find and edit it. Percolate is a great tool for social media planning, scheduling, reviewing and monitoring. It's an easy set up process and they have very responsive customer support. We are able to easily and conveniently schedule our social posts and funnel them through the correct approval workflows. This saves us time and offers great efficiency for our team. We are able to monitor the conversation around our company and products and make right any issues customers are having. It's great to see their comments/ feedback in real-time. "Bought it for social publishing, but got so much more"
We purchased with the intent of replacing Social Studio for about the same cost. In addition to best in class social publishing, we got something we have needed for a long time- a centralized cross channel marketing planner. Percolate works best when your entire enterprise is on it. We still publish print catalogs, so it wasn't appropriate (lacking workflow needed to print production) for our print group to use it. We create marketing plans in the system, but there isn't a neat way to export or allow non-license holders to view in Percolate. Percolate does several things including asset management, campaign planning, and social media publishing. It can replaces several systems at once, resulting in a cost savings. It requires very little runway to start achieving successes. It is intuitive and the training they provide is excellent. Also, their support is excellent. We didn't realize how much we needed a tool to create marketing plans. The templates a user creates within the campaign planning tool are outstanding. "great robust tool for a team willing to put in the effort"
For a marketing team, this has the most robust functionality of all the project management tools we've tried. Love the ability to filter for campaigns by tags, it allows us to maintain a marketing calendar that can be filtered by segment & region. We keep all our marketing request briefs in Percolate. No gantt chart capability! We are on beta to try out a new "hierarchy" function, which allows you to see project span and which ones overlap, but it is no where near as robust as Wrike or even some very low level gantt chart tools (like Tom's Planner). With our extremely integrated marketing teams, it is mission critical for me to see which projects overlap / have dependency, so gantt charts are critical. This is the one feature I need to use a 3rd party tool for. Of all the project management tools we've evaluated, this is by far the most robust tool for a content marketing team. However, it lacks some functionality for other marketing teams (i.e. gantt chart). Either way, know that you will need to invest a significant effort/time in the beginning to set up your Percolate infrastructure, in our case we have a full-time Percolate admin. But once you've trained the whole team and customized the instance, it's a great tool, and they're very willing to leverage customer feedback in their product roadmap. We have multiple marketing functions spread across 3 regions, we've had very little visibility into what other teams are working on and how each of our campaigns may aid or impede their initiatives. Percolate has been helpful in getting us all onto 1 platform (instead of 20 google docs). Though, it would be even better if we can have more view-only accounts, to allow non-marketing business partners (i.e. sales) to see our roadmap as well. "Oversold and under-delivered on platform capabilities"
Their hands-on training/guidance was excellent and their social media distribution worked smoothly. We were also impressed with the account reps we had. They were honest and focus on providing good customer service. Seemed to try to solve the problems we had - if only the product could deliver at the same level. The only strength is the social media distribution, which seems to fit more of an enterprise organization, and also still had its shortfalls. It would not integrate very well with LinkedIn, our largest social platform, or with Instagram. The DAM folders could not be sorted in alpha order - only random. The DAM lost our assets a couple of times and they didn't know why, nor could they promise our assets could be restored if it happened again, so we stopped using it for a DAM. They sold out of the box integrations that were not existing and ultimately came back and told us they couldn't do. They sold that they would offer campaign strategy advice, which our rep said they don't really do. The project management /workflows was weak. The intelligence and analytics didn't add any value. We cycled through multiple reps who left the company - good people too. This is not a content marketing platform. Only a social media distribution platform. We needed a content marketing platform and were sold that it would be an end-to-end solution. We ended up using it only for social media. From an administrator perspective, their social media platform was harder to work with than others but as a contributor, it was very easy and intuitive. "Great idea, but bad integration "
Ease of use to find photos and assets for my business group. It’s difficult to integrate our team to Use the product as the set up is clunky. We have now integrated our system to include project briefs with our marketing agency partners. Clunky system that is hard to filter to find specific product photos. The approval process in the system to include briefs is cumbersome. Asset management by putting all photos, videos, etc in one spot has reduced the amount of time spent trying to find products. "Percolate can do everything we need it to, but requires a lot of customization." I like the ability to make our own templates for briefs and different marketing channels. I don't like that we cannot update the templates in real time. There are also pretty basic font/type style options missing that seem to be a very standard part of most tools. Campaign management and transparency among not only marketing channel owners but the entire company. There are less emails to comb through and it is easy to look back at campaigns for reporting. Pretty easy to schedule things across a broad variety of platforms. There is no month-by-month view of creatives, only week-by-week, which I find very limiting. Also, it's needlessly tedious to schedule creatives, there are a lot of required fields that I often don't have the required info for, so I have to take the time to put in placeholder info until I have the real stuff. Get used to only being able to seeing one week at a time. Keeping track of social media and blog content schedules, and scheduling shares as needed. Having all your workflows in one place is ideal, and allows for a seamless approval process from drafting to submission to approvals. It's great to visually see your content calendar laid out ahead of time, and the media asset manager is a great way to share visual assets across markets. It was implemented to try to help with a global brand strategy across multiple markets; a lack of proficiency in the software in certain teams makes that functionality irrelevant. "Sold as project management and asset management tool, disappointed. " While the IU of Percolate was great and it had promise as a content management tool to help us work better across marketing, design and PR, ultimately the tool was sold to us as a "it can do anything you need" type software but it lacked in the specific areas of utility we needed, especially digital asset management. Lacked the content management capabilities we needed to store and access consistent brand assets across teams, and felt misled by their sales and customer support team. Be sure it meets the needs you have as an organization - I've heard its a great social tool but as a content calendar and digital asset manager it didn't meet expectations. We stopped using Percolate because it didn't solve our business problems of being able to provide access to non-marketing teams to approved brand assets while helping us organize and post our content to our owned media channels. "Percolate for the win! " -Intuitive features that help me stay organized, especially while working on multiple projects. -Easy access to top level stop photography. -Great team that's always been fun to work with. -Because the platform is ever evolving, sometimes features change with little to no warning, putting a pause on my usual fast paced workflow. -Although Percolate has a lot of great apps, there still isn't an option for posting and organizing assets easily from mobile devices. Take the time to really learn Percolate's tools in and out. There are so many cool features that exploring them all will only make your job easier. -Organization of all my campaign information. -Sleek design that helps me maintain focus. The organization of the campaigns is great. You can put as many briefs into one campaign as you like, and when you create a piece of creative from a brief in your campaign, it is linked to the campaign so it's always easy to find. It can be glitchy, and there are some things that don't make sense like the character limits for Instagram responses and for Facebook Carousel ads. Also, I always have to compress images before I put them into a Facebook ad to be scheduled or drafted, because anything over 4.0MB is "too big." We're able to monitor and listen to what people are saying about us on social, and the Twitter monitoring is very sophisticated because there's an advanced feature where you can filter by location, follow count, etc. For Instagram, none of these features are available (unfortunately). "A really solid platform—exactly what we needed"
We love having a central calendar that we can all access, and the social media posting capabilities are robust—intuitive to use and a great time saver. Using Percolate has definitely helped us to streamline our workflow and better plan out future content. 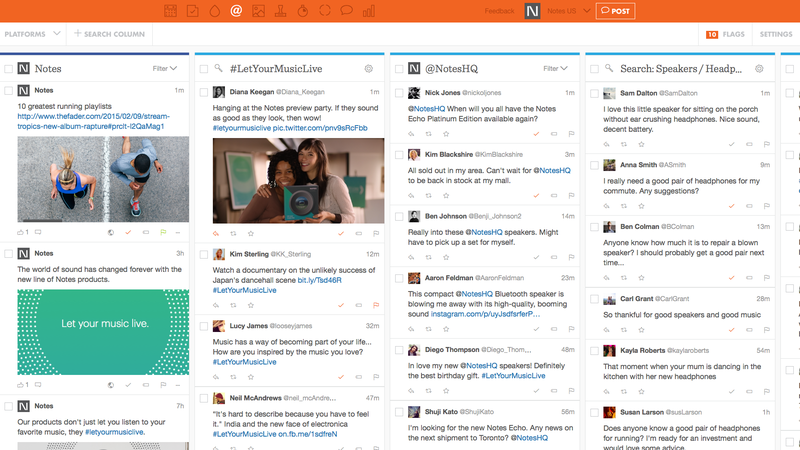 Percolate is awesome and a great social media management tool. Their listening capabilities aren't as robust as Sprinklr's, but it's much more visually appealing and intuitive to use. The customer service aspect has also been incredible; the whole team is responsive, warm, and a pleasure to work with. We've solved the problem of having to post natively to every single social media platform. The ability to see what's performing well and re-purpose content immediately is huge for us. Using Percolate has helped our editorial/magazine team and social team sync in terms of planning, and the more people who start to utilize the platform, the better aligned we'll be for all our marketing efforts. "Great for Social Media - not for ticketing and project management"
The social media aspect of the tool is the best thing. That you can't assign briefs or view the progress of a project. I can't assign tasks that can easily be assigned back to me for review. I also hate that you can't see who created the original brief or the components. The emails I receive do not send me to the project when I click them. And the calendar view is worthless since you can only see a few at a time. You also should be able to recently viewed briefs as well as the full name of docs as "v2" usually comes at the end of a doc name, not the beginning. I also wish there was a personal dashboard. I was hoping it would have more JIRA features along with the social media tools. For social media project management it's great, but it lacks in the project management aspect for sharing, reviewing and approving projects. Social media development and execution. Saves time and helps keep the calendar organized. Percolate's calendar planning tool allows us to look at our social content more holistically. The analytics section is also extremely useful in evaluating our campaign effectiveness. Also, the mobile software has made on-the-go social listening and posting so easy. It's also quite frustrating to not be able to post to Instagram, although I know that's no fault of Percolate's. In addition, the latest update to the asset editor created more problems than it solved. We've completely stopped using it. Spend some time with the analytics tool. It's a bit difficult to use at first, but once you have created a customized dashboard, it will be an invaluable tool. Percolate was the main tool we used to build our social presence from the ground up. It allowed us from the start to look at our social presence holistically, making it easier to be consistent across all networks we deemed important. In addition, the analytics tools helped us making smart decisions about what content we shared and when we shared it. Those tools have led us to an effective content strategy that's producing great results. "Percolate is a game changer." Organized, efficient, sleek & refreshing. Monitoring social streams has been a breath of fresh air, campaigns and briefs, assets - all things have been a monumental change to our strategy. Nothing to dislike. We've made a few suggestions that have been responded to and any question we have is answered in a timely/super helpful manner! Other than minor bug fixes and "wishes", we're definitely happy with percolate. If you need a place to organize your Social efforts with an outstanding team behind the platform, Percolate will ease any and every headache you have! We've never felt rushed to better understand the platform and any suggestion we've had has been fixed to some capacity. They're seriously proactive about adjusting any issues or getting rid of bugs. I'm very excited to watch this company grow! We needed to get organized - all of our Social efforts were placed in several different Google docs/apps. Now that we have everything in one place where assets and flagging are easy to share, our team is excited about Social, even if it's not in their job description. Percolate has created a place within our office where collaboration doesn't require a conference room, and file sharing doesn't require a downloaded program. Needless to say, we're very happy and looking forward to continuing in the platform. "Percolate is an important part of organizing, planning, and communicating our marketing plans"
Content can be saved, organized, branded, and posted on multiple social channels all from one platform. This saves a large amount of time when creating and implementing marketing campaigns. Social media trends, responses to customers, as well as reporting. The social calendar is not able to be imported or exported from Percolate. Also, users cannot be added to perform only one job or task. This platform allows our team to stay organized regarding assets, strengthening our omnichannel strategy, and allows posts to be monitored and responded to in one spot. Managing and monitoring social channels individually would be very time consuming and not very efficient. Percolate solves this problem for us. You are able to repost the same post. Provides a single view of multiple accounts and can filter to see individual accounts. The platform doesn't save the filters applied in the planner view so you have to reset every time you finish posting. Also, you can't post the same post multiple times at once. One centralized view of 5+ social accounts. "Great for sharing content within organization"
Easy to tag other team members and request information. Notification emails can be setup as well. take the time to learn how to use it to the best of its ability-my team has not had time to be trained on it and we are likely missing out on some great features. I like the approval workflow process, where everyone can examine a post before it goes live. Limitations on feature everywhere you turn. I still find myself using Tweetdeck for this, Buffer for that. I can't import tweets, I can't replicate Tweetdeck features. We had to create our own hack-esque workaround for our calendar. Every time I try to do something, I run into a limitation. It doesn't do everything I need it to, and it can barely replicate functions that Twitter's API most definitely allows. Like any social media management product, it is not that social swiss army knife you dream of. You'll still use an array of other products, as anything relying on something from a company (Twitter, Facebook) that lets you exist on its API begrudgingly, there's only so much Percolate can actually do. The problem of approvals. That's about it. I like the freedom and control I have over all of our social platforms. So many different options and scheduling ability. The price, the platform is slightly expensive but for all of the features you get, it's worth it. I highly recommend. We had to discontinue only due to the fact that the cost was too high for a non-profit but we miss it. Scheduling and reporting are exceptional out of Percolate. We can plan and get ahead of schedule while still maintaining control. "Not so easy to navigate, but well on its way! " I liked that you could see across teams and platforms all at once to avoid market saturation. The asset uploader was also incredibly simple, and easy to use. Posting across platforms was also a breeze. I didn't like how difficult it was to retrieve other team member's comments, as sometimes you could see them by hovering over the post in question, others you had to click through, and further than that you sometimes couldn't even find them. I would highly recommend it to others. Having used it in both an enterprise, and small business capacity shows its value for both uses. We were an agency creating posts (both text and image) for a client. It was becoming increasingly difficult to send large email files, so having one central hub where you could create the post, edit and preview it, and ultimately post was convenient. Percolate makes it easy to streamline content marketing processes across a multitude of platforms. I have seen how using this one system has helped our team stay on track and aligned. "Great tool for graphic management "
I honestly am new to it, but haven't found anything that I dislike yet. That said, I do know that I have more exploring to do within the tool. One thing I'm unsure of currently is whether global content can be centrally "pushed out" to our local markets, so they can translate and confirm the scheduling as necessary. What's great about this tool is the ease of being able to schedule evergreen and/or specific campaign content across key platforms. "Percolate is a wonderful system of record for social media"
The App makes it easy to plot content and approve creative on the go. It's also a great system of record and image bank. It would be nice to see the creative by month, like you can do in the weekly view. The mobile views of individual posts don't actually reflect what it looks like on a mobile feed. The image editor doesn't allow you to undo edits without starting over. Also the drop down for editing images doesn't always go away when editing pictures. Recently, responses to private messages on Facebook have not been going through. Finally, it would be wonderful to search for published content within the calendar. Sometimes we need to find posts from last year and it's more tedious without a search feature. In terms of communication, if there is trouble with the tool, we've had to reach out to our account executive instead of proactively being informed of the glitch. While there are a few things to improve upon, we love the customer service and how often Percolate improves it's tools and updates its features. Being able to plan out content, having a central place for multiple teams to see our work, and (most importantly) having a system of record for our social media content. "Great for Social Media organization, but needs improvements for general marketing use. " You are able to coordinate and manage all social media in one place, which is really convenient. The Brew is also a great resource for seeing all relevant social media activity on our brand as well as our competitors. You are not able to archive any campaigns, so you always have a growing list of projects that are active and complete. You are not able to limit permissions on folders or assets, which makes it difficult to post WIP assets or share items with only specific teams. We are able to track and report all our social media in one place. This has helped us realize how much more activity we need to improve upon. "Not the brand I would use"
So far what I dislike about it is that it’s seemingly made for large companies. Not designed for ma and pa shops. Make sure you have time to learn about this product. Taking your time will make this product worthwhile. I love the ability to tag posts and group content by campaign. The asset organization could be better. I also wish I could schedule Instagram posts on this site. This product is easy to use for anyone familiar with content management sites. I used Hootsuite in my previous role and had no issue transitioning to this software. 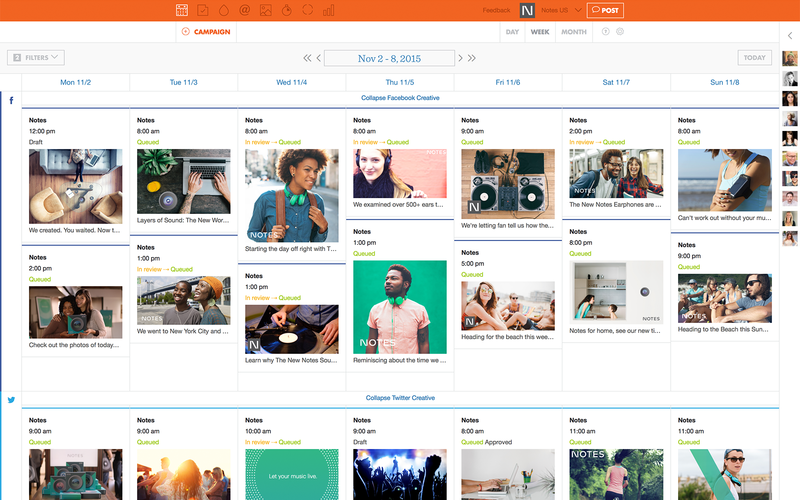 I schedule content for seven channels through Percolate, and it's easy to see everything in one place. I liked that you could download free images and add logo or writing to it. The program had great pricing. I only experience little time with the program before our license ran out so I cannot say what I dislike about it. Using new and fresh images were always the best part of Percolate but also being able to store our own assets in it was extremely helpful. "Pretty good for what's out the market"
It has great UX and has a very useful dashboard. Even an intern can more or less get up to speed. It can be a bit hard to customize to the specific needs of a campaign. But it is the best (by far) best management tool I've used thus far. Getting more feedback from our audience in a way that was easy to keep track of- our old tool had such clunky UI our campaign team was constantly fretting about how to finetune things as campaigns were running. Well-organized, easy to navigate, and provides multiple workflows. We only used this software for a handful of projects, but it was handy and helped us keep better track of our timelines. More workflow customizations would be ideal. For example, it was sometimes difficult to tell where exactly a workflow was sitting if I assigned it to multiple stakeholders at once. The trial was very helpful and I would recommend users set up a launch call with Percolate ahead of time - they were able to assist greatly. It increases the speed, organization and efficiency by which we are able to complete projects. This tool is amazing for analysis of the social media profiles through robust community management platforms at scale, in elevation. We find that 27% of the key modular component areas are interacting without intent. This can cause headaches within our internal team marketing platforms. We are solving several key compontnets to the way we promote multiple products in variation. Picture a product, without key, in the social environment? This is where Percolate steps in. "SMM is a commodity, but Percolate works if you have it." The ability to manage enterprise accounts in one place is important for an organization. It makes it easier to manage assets across a team. It's a little bare-bones in terms of functionality. But each tool works. It's a strong option and it just works. If you're concerned about being fancy and being seen as an "innovative thought leader," then a more expensive bespoke solution will suit you better. Deploying social media assets across multiple accounts, scheduling, and team management. I like the ability to re-post on multiple platforms. I like the approval workflow. I find the image library cumbersome. It can be easy to lose posts if they miss the publish time. I like being able to see everything that our brand is saying at any given time. We have also used the reporting functionality. I can also use it as a resource to see what we said in the past even if I wasn't a part of it. "Nice In Theory But Very Complicated Product"
I like that it does try to put in place guardrails around content marketing and editorial processes and calendars across teams. This is a big problem. This requires serious buy-in from teams and often doesn't work if people don't stay in the tool - which is bound to happen. Definitely talk closely with their engineering team and map out precise workflows before you sign a contract - there are some limitations as to what it can and cannot do. Percolate is a one-stop shop - you can totally handle all of your social media and content management needs. Percolate saves me SO MUCH time when it comes to social media. I can easily plan out campaigns and make sure they're organized and targeted to the right audiences. I love the analytics, which help me coordinate my content to the proper channels and at the right time. "Percolate is an easy to use system"
I like that I am able to have all of my marketing platforms in one place. It's easy to use and easy to teach to my colleagues. I don't dislike anything, I really do believe this platform is easy to use and there aren't a lot of issues with it that I would recommend fixing. I am now able to have all of my marketing platforms in one place making it easier to do my job more efficiently and effectively. "Fantastic Tool - Wish we had implemented." From the custom watermarks, to the easy and simple content search to share with your consumers, Percolate is in a class of its own. It allows brands to become publishers and operate with the efficiency that you seldom see from a traditional program. It adds a level of professionalism and management to your content that goes an extremely long way. Percolate can be a tough sell to clients who don't see the immediate benefit - after all it's very slick and arguably could be done in-house by an agency with a lot of legwork. However, Percolate would actually have been more cost effective due to the time that we'd save through implementation. Perfect tool to implement a complex social publishing system with a variety of agency/client management options. Percolate would have allowed us to take on and fully realize the voice/content management of a complex brand with many different facets. I'm actually bummed we never got to implement it. "Percolate helps connect disconnect teams with ease. " Simple to use. Clean look. Easy to teach colleagues. Some bugs, but they're quickly solved by the team. Bridging gap between different departments with similar, but different goals. "Lands Flat Despite Premium Pricing"
Effectively provides a baseline for 'social media sharing for dummies' - not a dynamic or exceptional tool versus an easy, introductory path to getting content beyond basic online.